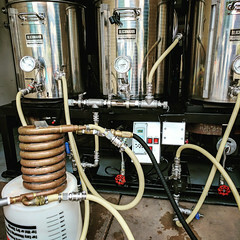 Last Saturday I brewed up a batch of Coffee Milk Stout and during the setup of the home brewing system I took several still and combined them together in this home brewing animated gif. It allows you to get an idea of most of the home brewing gear that I am currently using in my homebrew rig. For the most part a use a combination of Blichmann, SS BrewTech and MoreBeer gear to complete my homebrewing rig. – Stand alone is approximately 70 lbs. 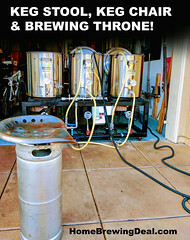 Coupon Description: MoreBeer.com currently has a coupon code that will get you a Braumeister v2 Homebrewing System for $1,549. The Braumeister beer brewing system truly simplifies the all grain home brewing process. This innovative brew rig is an all-in-one, electric all-grain brewing system that will ship to you free of charge from MoreBeer!. Made by our long time business associate Speidel of Germany these systems are imported and supported in USA by MoreBeer!. The Braumeister features an automation and ease of use that is unparalleled in brewing all-grain beer at home. This Braumeister Home Brewing System has a very small in footprint and is powered by electricity allowing you to brew inside, in a confined space, without the fear of carbon monoxide gas from a flame source. Additionally, the Braumeister is very easy to use. 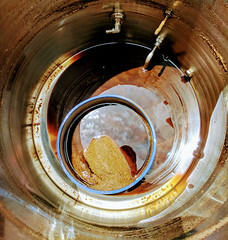 In fact, you mash your grain and boil the wort in the same vessel. Before you brew you set the controller with the different temperatures you wish to attain and the built in heating element and pump do the rest. MoreBeer.com just released their new Digital Homebrewing Rig! MoreBeer just released a follow up to their popular line of Homebrewing Brew Sculptures and Brew Rigs and they are bringing homebrewing to a whole new level with a digital touch screen interface. 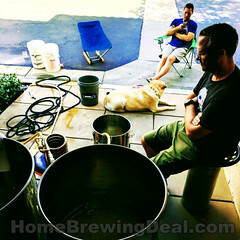 Check out more details on this new MoreBeer homebrewing system by clicking on the following link!